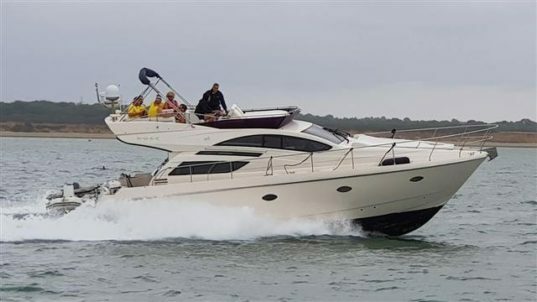 Hamble Powerboat Charters provide skippered charter boat trips and experiences on board large, stylish fast motor cruisers, at competitive rates. 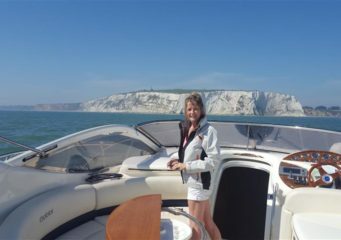 Visit Isle of Wight ports from Portsmouth, Hamble and Southampton on an exclusive day trip. Experience exciting events throughout the season. 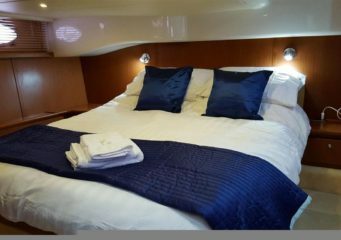 Add an overnight stay on board to create a luxury mini break. Visit stunning bays, historic ports, and top trending restaurants. See our News and Events pages for more information. Contact us now. 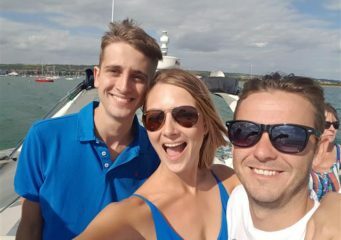 Please see our Skippered Charter Boat Trips page for more information on our Solent boat trips, overnight stays and more. Options on weekdays and weekends. Go to our Gallery and Fleet pages to look around the boats. You can check prices for weekday and weekend bookings in our secure Shop. Then Contact us via our secure email form to let us know your chosen dates and number of guests. Or just give us a call anytime on our freephone number 0800 6785697. Please wait a moment to be connected while you are routed to one of our mobile numbers as we may be on the boat! Thank you. Have a look at our Facebook, Instagram and Google+ pages for more photos and reviews. At the office in the morning? 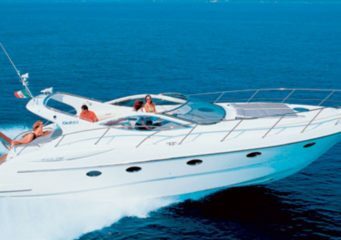 Our Solent powerboat hire fleet includes fabulous open and flybridge cruisers and RIBS. Our fleet is based at Port Solent, Portsmouth. Just minutes from the M27 and with easy access via the M3 or A3 . Port Solent is a locked marina with an excellent choice of restaurants and pubs and we offer private parking for all our guests. 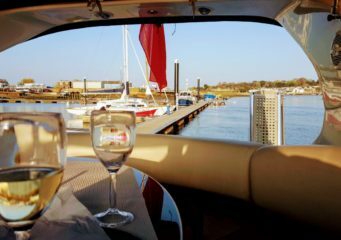 Guest can also enjoy boat trips departing from from Swanwick Marina on the River Hamble, Southampton or other ports and Marinas throughout the Solent. Book now for Lendy Cowes Week 2019, the Fastnet Race start, Round the Island, Cowes Classic, The Hut Restaurant trips, Yarmouth Salty’s Restaurant trips. Advance bookings being taken now. 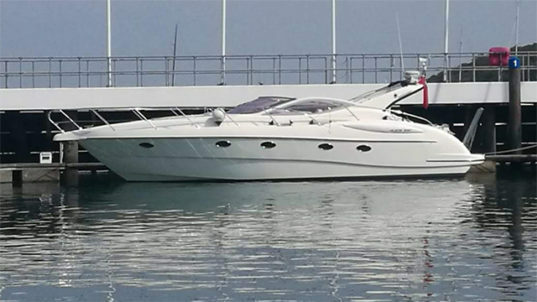 With her curvy Italian styling and at a full 45ft Allegro is a large open cockpit fast cruiser perfect for outdoor socialising and entertaining with sunbeds fore and aft and plenty of luxurious space below deck. She is powered by twin supercharged and turbocharged diesel engines producing over 640 horsepower. 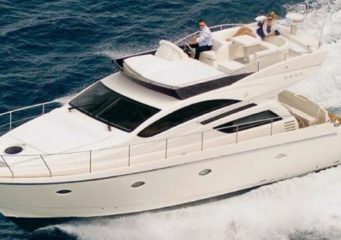 Allegro can carry 10 guests and 2 crew and is available now. 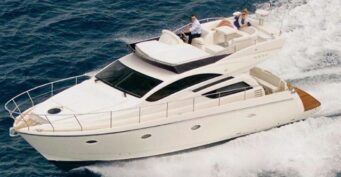 True Colours is a Stunning flybridge motor cruiser approaching 50ft in overall length. She has a beautifully appointed large bright saloon, carpeted with gorgeous leather upholstery and polished light wood joinery as well as a state of the art lower helm position. 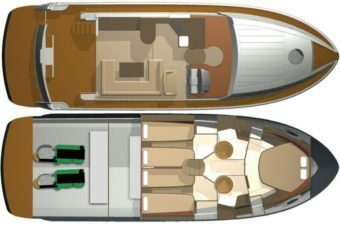 The saloon leads down to a large forward double suite, two bathrooms and two further twin cabins. 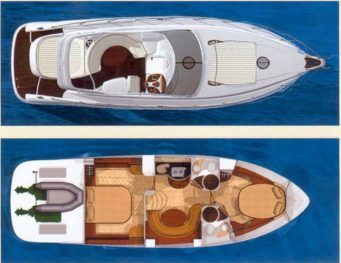 The saloon is enclosed by sliding doors to her rear deck outdoor entertaining space. From here stairs lead up to her open air fly bridge with secondary helm and further guest seating and a sunbed. With twin Volvo IPS 500 370hp engines she is fast and agile and perfect for Solent day cruises. (see gallery). True Colours can carry 10 guests plus 2 crew and is available now. 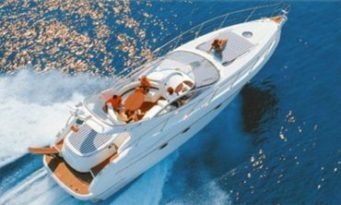 See our skippered charter boat trips and shop for pricing. 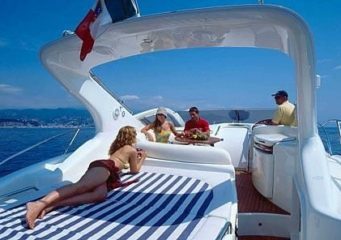 Please Note: We do not provide bareboat charter on RIBS. 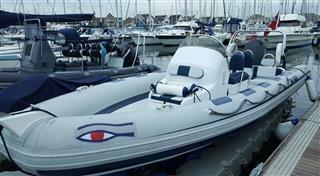 B1 Is a new 6.5 metres Ribeye Rigid Inflatable Boat (RIB). 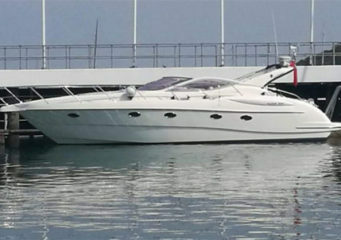 With the ability to carry 8 persons on board and with a top speed of 40+ knots, she is fast and agile. Loaded with the most advanced technology and instruments, she is available all year round for commercial work, bespoke charter and tuition. All of our RIBS can also be configured to your specification with additional storage or seating as required to suit. For high speed RIB Experiences and fun trips and team building contact us now. 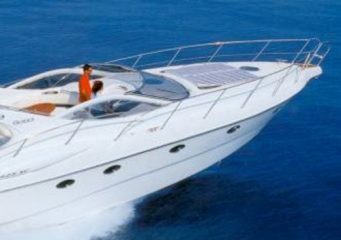 Powerboat Hire in the Solent from Hamble Powerboat Charters. To book a trip on your chosen date, please contact us using the online form below. Or call us on our freephone number 0800 6785697. When calling please wait a moment while your call is routed to one of our friendly team. 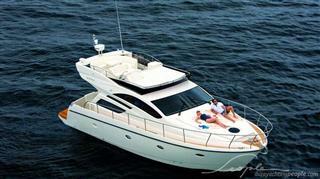 Want to reserve a charter right now? Go to our secure shop for prices. 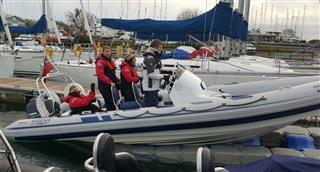 Hamble Powerboat Gift Vouchers are a perfect risk free way to reserve your trip. 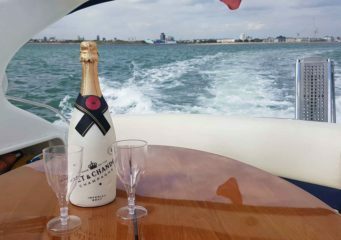 A single gift voucher bought in advance can be exchanged for one of our weekday Charter “Taster” Experiences or against a full day charter. When ready bookings can be made in our secure shop by debit and credit card. All prices are inclusive. Email us via our contact form above.